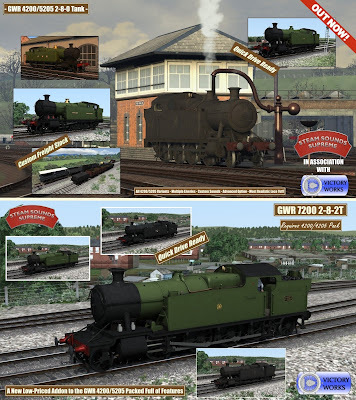 Victory Works: GWR 4200/5205 and GWR 7200 Out Now! This is our most feature packed locomotive to date with great realism details including improved "by the shovel" stoking and brand new second valve regulator effects as well as all the usual effects you expect from us and some all new AI behaviour as well. The sounds from Steam Sounds Supreme are superb, recorded from members of the actual class running in preservation and to top it all off a list of period freight stock is included for working these beasts as hard as possible. The 7200 also includes 2 bonus loads for the Crocodile and Weltrol trolleys; new and used Swindon boilers. I'm not a steam type but I just take it. Great locos!